Threaded inserts are glued into the granite. The threaded inserts are set back approximately 0.5 mm below the surface. 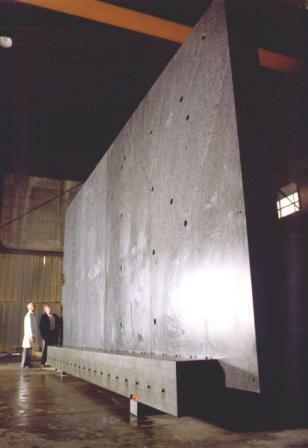 Granite components can be manufactured in very large sizes. To reduce weight, a sandwich construction is possible. High-precision components can be ideally made ​​of granite. The reasons for this are primarily the extremely good properties of this material. Granite is by its fine crystalline structure, low expansion coefficient, high wear resistance, optimum vibration damping, and freedom from unwanted stresses the optimal basis for the manufacture of precision products. In the processing of hard rock you can reach a very fine surface quality. 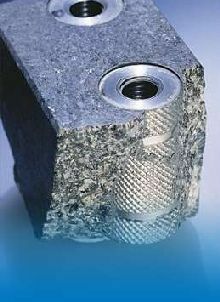 This granite components are particularly suitable for air-bearing guides. Here, the air consumption due to the high surface quality is kept to a minimum. 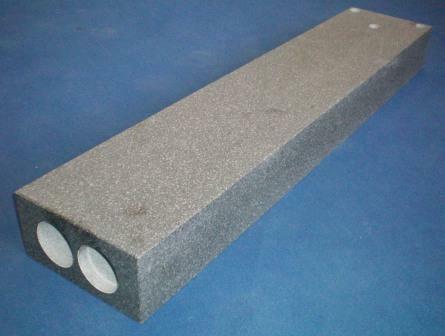 The use of granite is worthwhile in any case, whenever the quantities of components, such as machine beds or high-precision base plates for guidance bar, are relatively small. If the number of units per year will be over 50, then one can consider the use of polymer concrete. For polymer concrete, we can also make you an offer. But keep in mind the high initial cost due to the production of the form. Table 1: Physical properties of various construction materials in engineering. 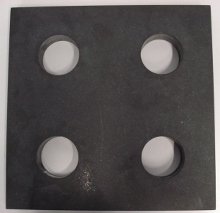 Granite measuring plates serve as the basis for inspection, assembly and laboratory purposes. The plates are made from black hard rock (granite). The surface of the measuring plates is first finely ground and then lapped. The sides of the measuring plates are ground clean. 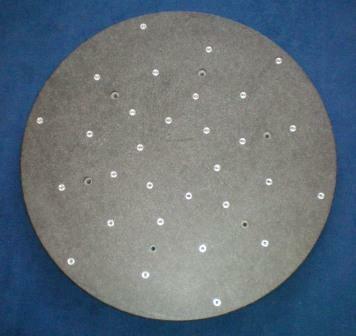 The flatness of measuring plates is classified according to DIN 876. 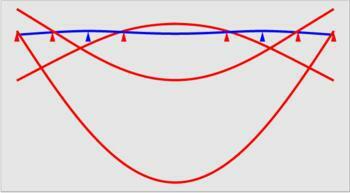 The bending of a uniformly loaded beam for different pairs of contact points: The blue curve shows the storage at the Bessel points. The vertical scale is greatly exaggerated. Place the measuring plate marked on the three contact points. Level the measuring plate by adjusting the three contact points (horizontal set). All other points are used only as a safeguard against tipping and be supplied only by hand. All standard measurement plates from THOME Precision match the contact points of the Bessel contact points. About 22% from the edge of the contact points are the least deflection.
. Fig. 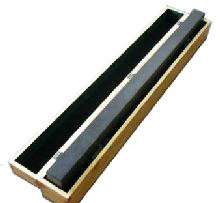 S1: Granite bar in a wooden case. 2.000x200x120. One piece available. Fig. S3: Granite bar with holes. 5 pieces available with slight damage. Fig. S4: Round granite table. Ideal for use as a round table top. All offers are subject to change. Intermediate sale is reserved. Plus transport and packaging. 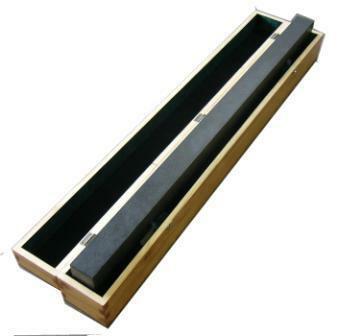 Measuring bars of granite can also be porduced in very large sizes. According to the customer we can add holes and milled slots. The main focus lies on the parallelism of the longitudinal surfaces. The underlying standard is DIN 874 for parallelism. 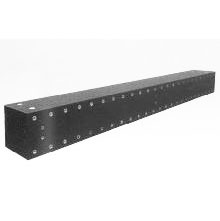 Mainly measuring bars are used for control of straightness and parallelism of guidance and for alignment. Table 3: Measuring bar made of granite according to DIN 874. On request we can also produce higher accuracies. You can see here are just a sample of our delivery programme. Special requests like additional holes can be realised. 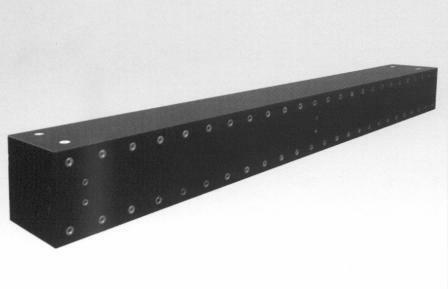 We are also able to produce measuring bars with 4 longitudinal surfaces which are parallel. Please send us an e-mail with your requirements. Quadratic angle standard made of granite have the advantage that they ensure the accuracy by their more symmetrical shape and are also thermally stable. 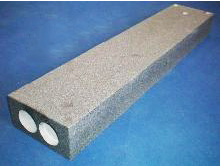 Rectangular angle standard made of granite. Ideal for checking geometries machines with long Z-strokes. Hard rock angle standards are used primarily to control the 90-degree angle. The angle standard is ideal for rapid alignment of angularity (for example for measuring machines and machine tools). Four small surfaces of angle standard are parallel and perpendicular lapped. The specification of the angular accuracy is related to the long leg. The two large surfaces are ground. To reduce weight and for better handling through holes are inserted. If desired, threaded inserts for eye bolts can be placed. The underlying standard is DIN 875 for perpendicularity. The package includes a wooden case and a test report. Table 4: Angle standard from hard rock 90 ° rectangle shape to DIN 875. Triangle angle standard made of granite. 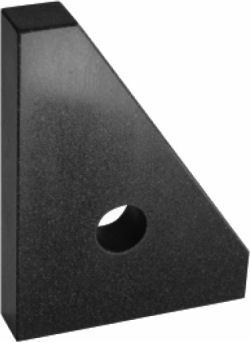 These granite angle standards are used for control of 90-degree angles. They are made of dark granite. The two small legs are perpendicular to each other lapped surfaces, the remaining surfaces are sanded clean. The angular accuracy is related to the longer leg. To reduce weight and better handling through holes areintroduced. The underlying standard is DIN 875 for perpendicularity. Supplied with a wooden case and a test report. Granite cubes can be manufactured so that all six sides are perpendicular to each other at the edges. The opposing faces are parallel. These granite cubes are used as angle standards. The angle check is time-saving and highly accurate. 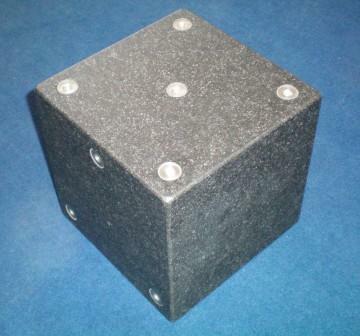 Granite cubes are used in machine tools and for CMMs for rapid geometry testing. The granite cubes are made of dark granite. All six sides are lapped perpendicular to each other, opposite sides are parallel. The angular accuracy is related to the longer leg. To reduce weight and for better handling through holes can be inserted or threaded inserts can be placed. Just like you wish. Table 6: Granite cubes, 90° angle according to DIN 875.